Friends of Mianus River Park recently reopened a Nature Trail in the park and created an accompanying guide and map. By using them, visitors can enjoy and learn more about the natural beauty and ecology of the park. 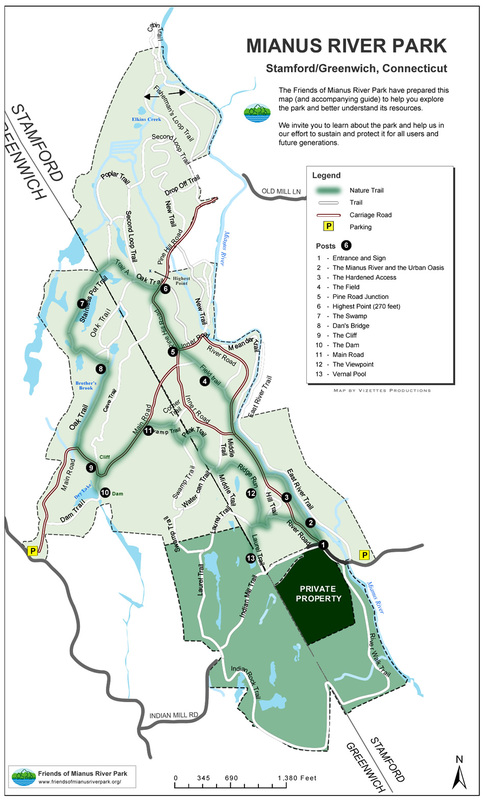 The trail, guide and map are based on an excellent project initiated in 1996 by the Mianus Coalition. For those who don't have a mobile device or prefer to be "disconnected" while visiting the park, both the Nature Trail Map and it's accompanying guide are available in PDF format for printing and offline viewing. The Guide folds down the middle and prints very small on normal letter size paper. It is recommended to print it on 11" x 17" tabloid size (if at all possible) for better readability although folded, the letter size fits conveniently in your shirt pocket. The trail is marked with green blazes painted on trees along the way. There are thirteen points of interest, marked by numbered green posts, covering a variety of features in limited detail. They can be used as a starting point for further study or simply as a brief description of what can be noted during a walk in the woods. The guide has been written in a question and answer format which makes it suitable for families with children. The route is about two and a half miles in length and takes about two hours to complete at a leisurely pace. Numbers start at the Stamford entrance to the park. From the Stamford side - from the parking lot on Merriebrook Lane in Stamford, cross the bridge over the Mianus River, and walk up the road to the main gate. Start your nature walk at green post number 1 beside the gate. From the Greenwich side – from the parking lot on Cognewaugh Road follow Main Road, pass the junction with Oak Trail and look for green blazes on the trees. The first green post when entering from the Greenwich side is post number 9.